Mozilla Prism brings web applications to your desktop blurring the lines between web apps and desktop apps. Prism is based on the same technology as Firefox browser but is designed to run your web applications just like its desktop counterparts. 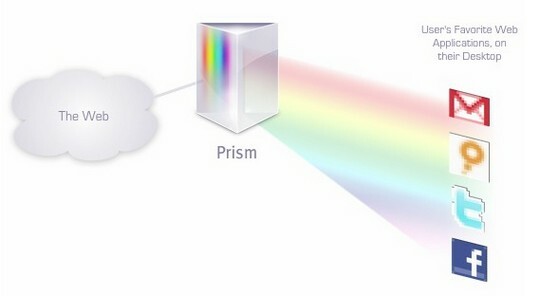 It gives you the best of both worlds letting you access apps from anywhere in the Internet via a browser and on your desktop via Prism while you are at your computer. Prism is also available as a Firefox extension that lets you dynamically split a web application to your desktop right from your browser. You can read more in my Mozilla Prism review here. I recommend taking a look at that before continuing if you are new to Prism. What started as a Mozilla Labs experimental project has reached v 1.0 beta today with some significant improvements. Also, Prism has a new website. Tray icon, submenus & system tray menus support. You can find out how to use Prism from one of the above articles or through this official Prism how-to video. Although there are workarounds to get Firefox extensions working in Firefox, Prism really needs full out support for Firefox extensions. Just Greasemonkey and Stylish add-ons can make Prism so much more useful and I will stop using Gmail and Google Reader in Firefox. I am sure it is coming soon as the Add-ons window has been in Prism since a previous release. Take a gander at the Prism Google Groups site if you have questions on it. With technologies like Adobe AIR, Silverlight are gaining momentum, it is nice to see this little jewel from Mozilla Labs making its stride into becoming a powerful tool. And I am rooting for it. I wrote about this very recently on my blog. You can actually combine both Prism and Google Gears together to create a web app on your desktop that can be run offline. Which means you can actually have Remember the Milk, Google Calander running like a program on their own independently without the net. It’s an awesome concept and very lightweight as well. It is stuff like this that fascinates me about your site. Seriously, where do you find all your info @ man?